Analog multiplexer/demultiplexer med 16 ingångar/utgångar. 16 analoga källor kan anslutar och med 5 pinnar kan man få ut informationen. Går även att köra modulen omvänt, dvs. att kan skapar utsignaler. CD74HC4067. This is a breakout board for the very handy 16-Channel Analog/Digital Mulitplexer/Demultiplexer CD74HC4067. 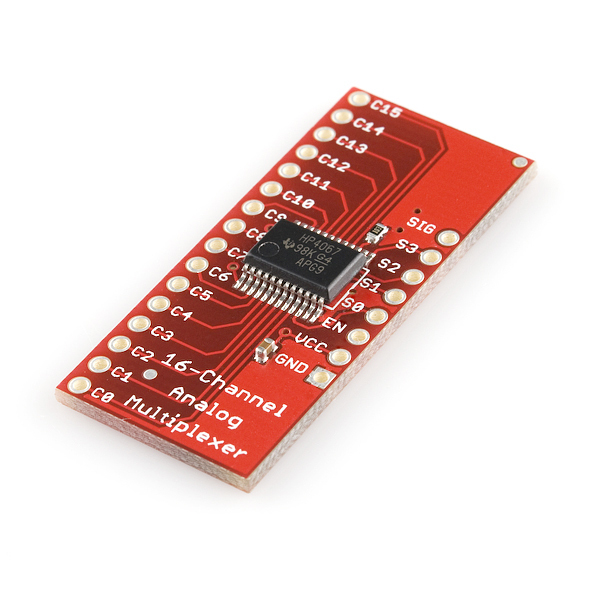 This chip can be used to connect 16 analog sources (like sensors) to 5 pins on a microcontroller. 4 of the pins must be digital pins, 1 pin must be an analog to digital conversion pin. This allows 16 sensors to operate on only 5 pins of a micro! This is a great way to connect a lot of sensors to a few pins. You can also run the mux/demux the other direction. One serial stream connected to the SIG pin can be piped to multiple outputs. The mux/demux also works with digital signals (like serial, I2C, SPI). This means you can hook up multiple serial devices (like a GPS TX pin, and a XBee DOUT pin) to one RX pin on a microcontroller. The IC can control analog voltages that vary across the voltage supply range. The bidirectional switches allow any analog or digital input to be used as an output and vice-versa with a ”Break-Before-Make” switching of 6ns at 4.5V. In addition, the switches have low ”on” resistances and low ”off” leakages. Includes and enable control which when high will disable all switches to their ”off” state.